On your birthday: 50 points ...and more! To discover all the ways to earn points, click on the Rewards Program tab on the right side of your screen on click HERE. How Do I Join Biscotte Yarns Rewards Program? Simply create a Biscotte Yarns customer account and you will automatically become part of our program. Or you can join by using our Rewards Program tab on the right side of your screen. Earn 1 point for every $1 you spend on BiscotteYarns.com*. Each time you spend, you will receive an email with your updated loyalty points balance. There are also plenty of other ways to earn loyalty points under the Earn tab of your loyalty profile, such as following us on Instagram, or referring friends. Use your loyalty points to claim rewards you want, or save them up to unlock bigger rewards. *Excluding wholesale purchases, any shipping fees, taxes and discounted items. Each time you shop on BiscotteYarns.com, you will receive an email with your updated loyalty points balance. From this email, click into your customer portal and claim rewards if you wish to. You can also log in on our website by clicking on our Rewards Program tab. When you have unlocked a reward, you will receive a unique reward coupon. You can redeem your reward coupon at checkout. Just copy and paste your unique code into the Discount bar and click Apply (only one coupon code per order). Please note that your coupon code is valid for 12 months). 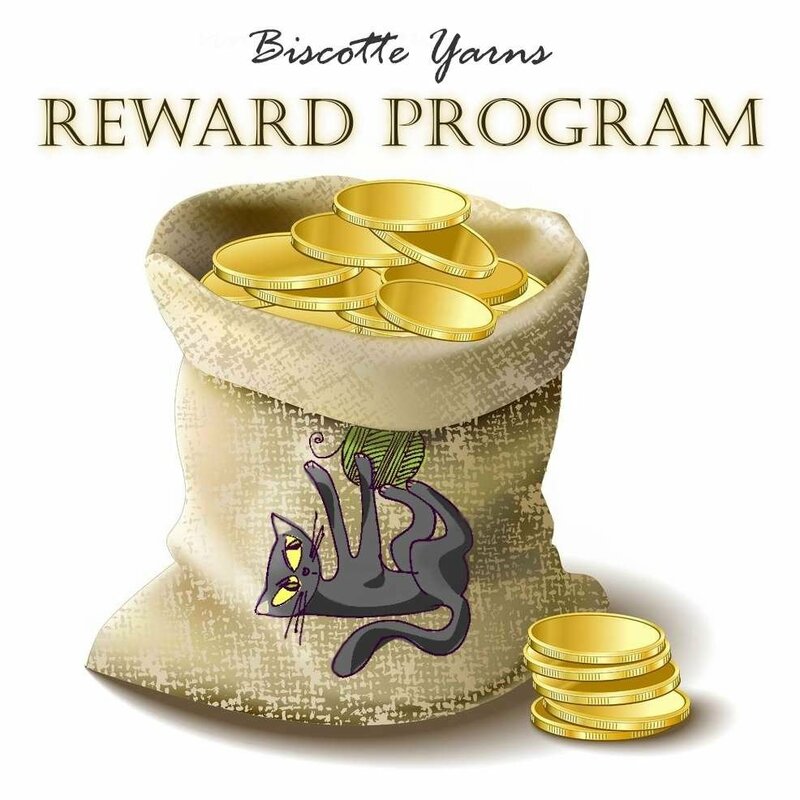 Biscotte Yarns reserves the right to modify the reward program at any time. If you redeem your coupon for a reward less than the full value of the coupon, the balance of the coupon is not redeemable on another reward. If you return any of the items purchased with a coupon, the item's value may be subtracted from the returned credit. Wholesale orders are not applicable and will not be included in the Reward Program.